Antiquity was the pits. For every advancement in philosophy or mathematics, you had half a dozen crazed aristocrats high on mercury potions trying to remove your limbs in bold new ways. Here are five particularly egregious ways to kick it centuries ago — they involve (among many things) honey, wine, eels, and inappropriate touching. [...] reservoirs [of] huge [morays] that had been trained to eat men, and he was accustomed to throw to them such of his slaves as he desired to put to death. It's worth mentioning that some descriptions of Pollio's prized pool toss lampreys instead into the hungry depths, but such a death by jawless sea sausages comes across as improbable. 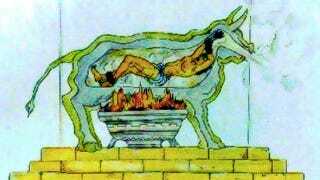 In sixth century BC, the Greek tyrant Phalaris would roast undesirables inside the "brazen bull," a hollow statue whose pipework would transformed their screams of agony into bovine bellowing. Getting cooked alive is dreadful enough, but having your frenzied pleas for mercy translated into moos demands a Curb Your Enthusiasm tuba sting. Among other kinds of tortures he invented, one was to draw in the poor wretches to drink a great quantity of wine, and presently to tie their members with a lute string, that he might rack them at once with the girting of the string and with the pressure of the urine. And now, something to make the tying of the urethra and slugging a gallon of muscat sound positively PG-13. For a Persian execution method called "scaphism," the doomed were lubed up with honey, force-fed more honey and milk, and sandwiched between two boats like a human walnut with their head and extremities hanging out. The victim would defecate inside the boat, which — along with the honey — would attract insects, who would proceed to eat the unlucky and their excrement. Taking two boats framed exactly to fit and answer each other, they lay down in one of them the malefactor that suffers, upon his back; then, covering it with the other, and so setting them together that the head, hands, and feet of him are left outside, and the rest of his body lies shut up within, they offer him food, and if he refuse to eat it, they force him to do it by pricking his eyes; then, after he has eaten, they drench him with a mixture of milk and honey, pouring it not only into his mouth, but all over his face. They then keep his face continually turned towards the sun; and it becomes completely covered up and hidden by the multitude of flies that settle on it. And as within the boats he does what those that eat and drink must needs do, creeping things and vermin spring out of the corruption and rottenness of the excrement, and these entering into the bowels of him, his body is consumed. When the man is manifestly dead, the uppermost boat being taken off, they find his flesh devoured, and swarms of such noisome creatures preying upon and, as it were, growing to his inwards. ...and to cleanse your brain of all that ancient gross-out, we have scheduled Helen Mirren dancing in Caligula as an intermission. Enjoy. He also had made for himself a machine, if one should call such a thing. It was the image of a woman, dressed in expensive clothing, in appearance a well-executed likeness of the wife of Nabis [...] When the man shook her hand, rising from his chair, he made the woman stand and embraced her with his hands and drew her a little bit to his chest. Under her dress she had arms and hands and breasts covered in iron nails. This makes the Middle Ages look genteel in comparison, as they were merely content to make shudder-inducing Satan robots back in those days. Images: Steve Van Tendeloo/Wikimedia Commons; Philosophy Geek/Wikimedia Commons; Akarlovic/Wikimedia Commons.